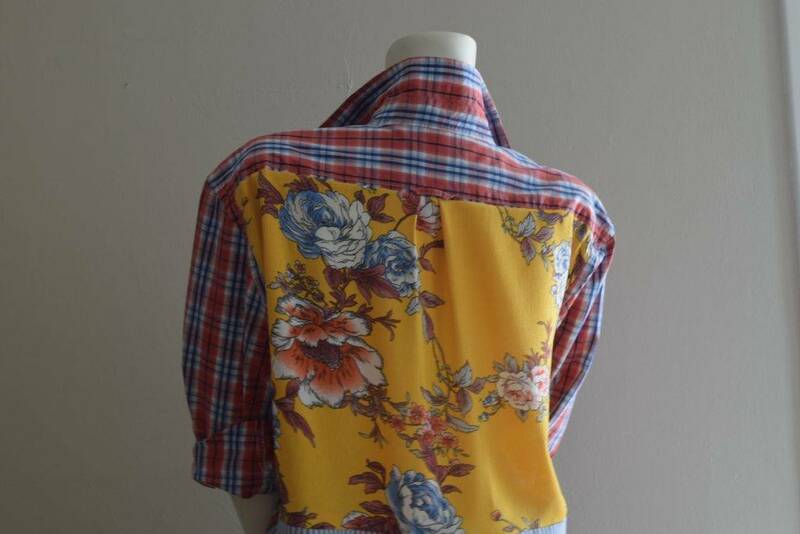 I adore the patchwork look of upscale designer clothing. 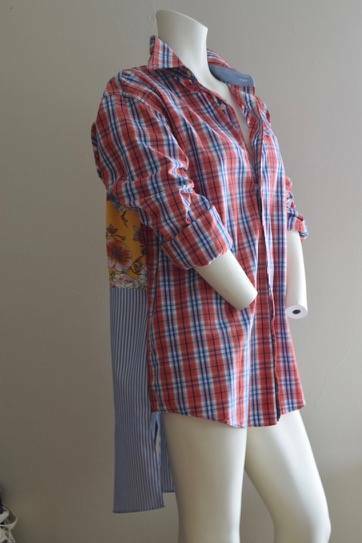 This sewing hack uses a couple of thrift-ed men’s dress shirts and some fabric scraps to bring new feminine style! 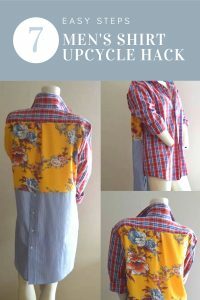 Up-cycle hacks are all over the internet, and some of my favorites use men’s dress shirts. 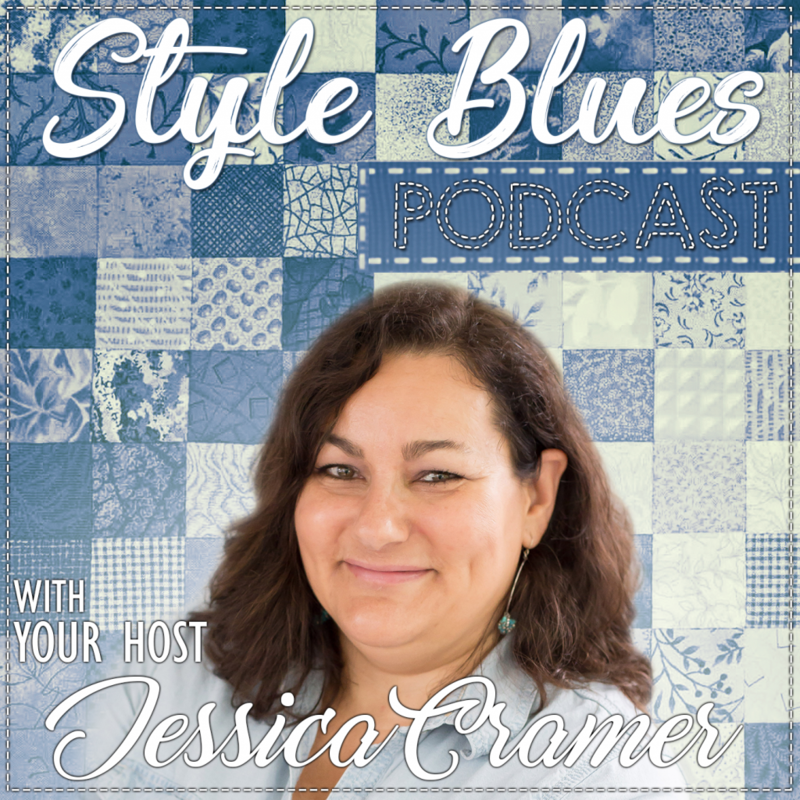 They are inexpensive, plentiful, and come in lots of great fabrics. 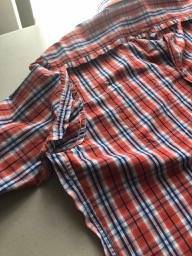 I have been keeping this one on hand for a project for some time, I loved the orange and blue plaid colors but it was just too unfeminine for me to wear without feeling awkward. 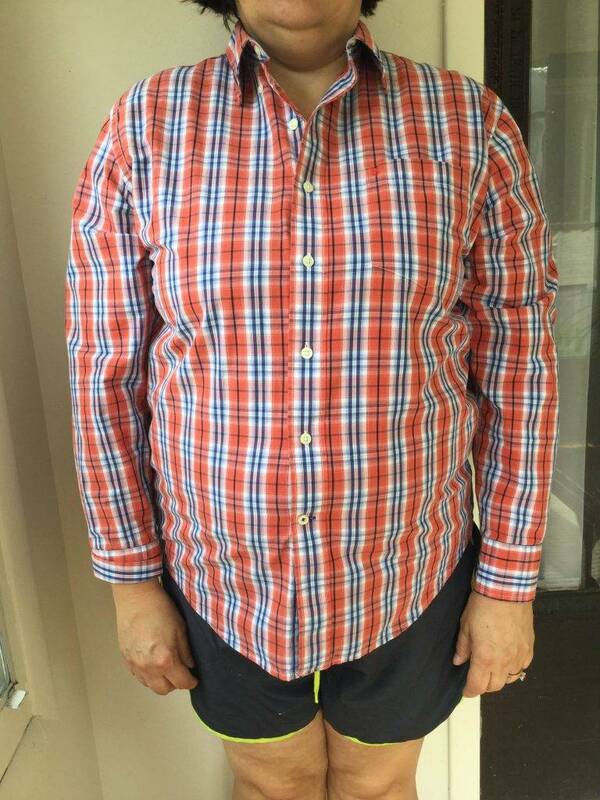 It also didn’t fit very well around the middle, which is no surprise as this is my biggest fit problem! 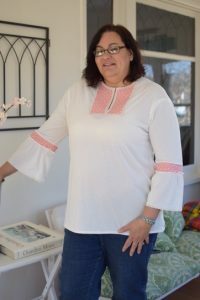 My inspiration came from this shirt from Soft Surroundings. 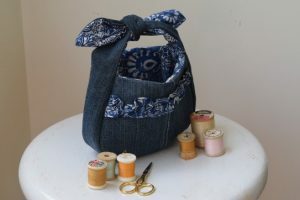 My former workplace, I always loved seeing how their designers put fabrics together in new ways. 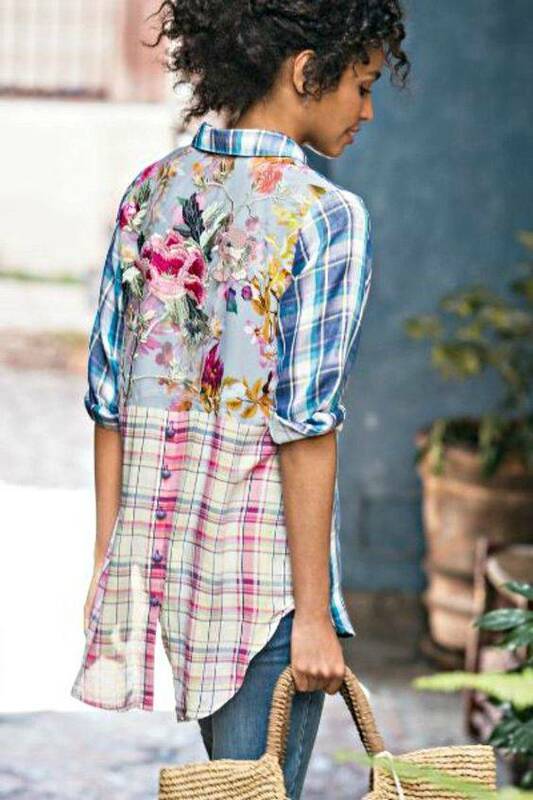 The feminine look of the back of this shirt was what I loved about it. 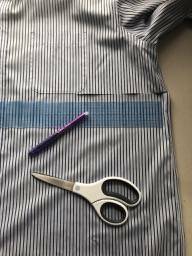 Remove the shirt back by cutting 1/2″ away from the armhole, yoke and side seams. Leave seams intact. 2. 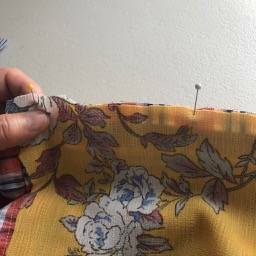 Use the piece you just removed as a pattern for cutting the contrasting floral fabric, adding 1/2″ to the top and side seams. 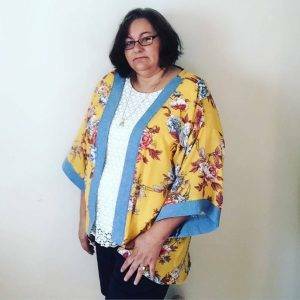 Cut floral hem slightly shorter than the original piece, at your natural waist. 3. 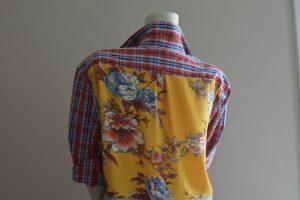 Cut the second shirt, under the armholes, across the front button placket and remove the back. 4. 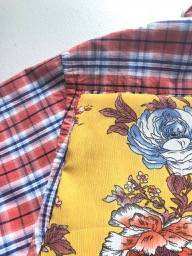 Pin top edges of floral fabric to the seam allowance just under the yoke. Stitch in place making a 1/2″ seam. 5. 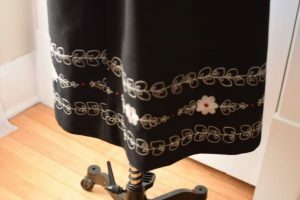 Sew sides of floral fabric to the back armhole, underarm and side of shirt. 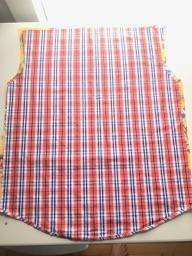 Break stitches at top corner as you sew, clip fabric as needed to get a square seam at shoulder. 6. 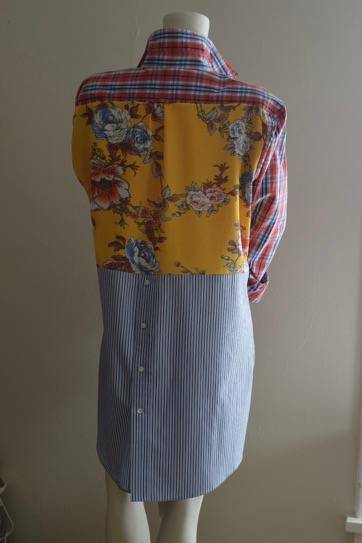 Sew top of stripe fabric to the floral fabric, putting the button down placket at center back as pictured above. 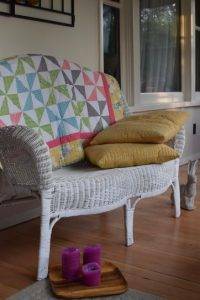 Sew side seams and press. 7. 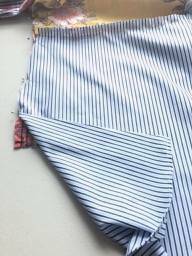 Finish side seams of shirt tails with 1/4″ rolled hem.